The first acceleration tests for the Hennessey 700 hp 2013 Ferrari 458 Spider with Twin Turbos are in and this supercar is ultra fast. When John Hennessey showed me the 2013 Ferrari 458 Spider with twin turbos he was building on a visit to his shop in May, I couldn’t believe my eyes. The red Ferrari was still in the developmental stages and he couldn’t give me many details. 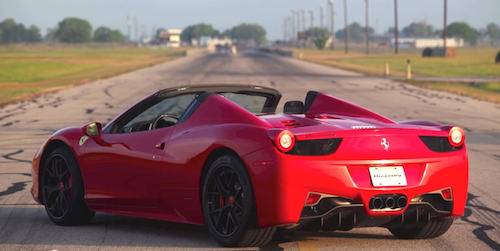 But the performance shop in Texas just released two new videos showing the acceleration test and it shows just how powerful this new twin turbo 458 really is. Hennessey Performance doesn’t give us any specific performance numbers yet on the Hennessey 700 hp Ferrari 458 Spider Twin Turbo, but from the videos below, we can see it’s going to be ultra fast. John Hennessey doesn’t do anything half way, and this 2013 Ferrari 458 Spider will be one fast road car. They outfitted the already potent sports car with tuned twin turbos that pump up the horsepower to 700. They have recently dyno tested the Hennessey-tuned twin turbo set up but the exact details are yet to be released. The 458 Spider from the factory comes with a 4.5-liter direct-injection V8 that is mated to a seven-speed dual-clutch automated-manual transmission. The V8 cranks out 562 horsepower at a staggering 9,000 rpm and 398 lb-ft of torque at 6,000 rpm. The 458 Spider will sprint 0-62 mph in just under 3.4 seconds. So the Hennessey Twin Turbo engine will be even more impressive. If Hennessey is reporting the Twin Turbo 458 is pumping out 700 hp, we know they measure hp from the rear wheels and not the crank making it even more impressive. The 2013 458 Spider continues the long tradition of Ferrari mid-engined V8 convertibles and is the first mid-engined model to feature a folding hard top combining performance and style perfectly. It’s the world’s first mid-rear engined berlinetta with a retractible hard top, it offers best-in-class opening and closing time and its light-weight design is lighter than a soft top. We can’t imagine how much fun this new Hennessey creation will be with the top down. Hennessey Performance's (HPE) operates out of their main shop that has a 30,000 square foot facility and is located adjacent to Lonestar Motorsports Park, the company's test track and IHRA sanctioned dragstrip. The complex is located about 45 minutes west of Houston, Texas along Interstate 10. This is the same shop that builds the Venom GT supercar that set a world record run earlier this year. Watch for yourself as Hennessey takes the 2013 Ferrari 458 Spider with tuned-twin turbos out for acceleration tests and see just how fast this new supercar is going to be. Interested parties can contact John Hennessey at 949-206-1120 for more information. Watch 700 HP Ferrari 458 Twin Turbo by Hennessey - Acceleration Testing videos.